If you have a spinal cord injury or have had surgery on your spine you may require inpatient care. The inpatient spinal cord unit treats adults (over 16 years) who have suffered a spinal cord injury (SCI) either due to a traumatic injury, non-traumatic illness (excluding cancer related causes), or require rehabilitation following a surgical procedure on the spine. Our team works with you and your family to optimize function and prepare you for discharge to the most appropriate setting. Activities with the team will focus bowel and bladder care, dressing and bathing, emotional well-being, sexual health, equipment needs, pain management, skin care, and mobility. Patient and families are engaged in the treatment and discharge planning throughout the hospital stay. The amount of time spent on the spinal cord unit depends on your needs and the discharge plan that you establish with the team. Many patients spend 2 to 3 months with the team before discharge. As you become more independent the team will help you arrange weekend passes so you can leave the unit to visit with family and friends. 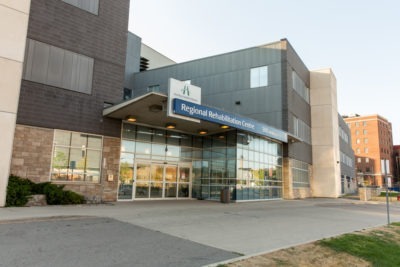 If you live in the Hamilton area you may attend further therapy in the Regional Rehabilitation Outpatient Service on the main level of the Regional Rehabilitation Centre. This will be discussed as part of your discharge plan. Patients from other areas will discuss outpatient therapy opportunities in their home communities as part of their discharge plan. On the main level of the Regional Rehab Centre is the Patient and Family Learning Centre. This provides, print, audio, and video materials on spinal cord injury, healthy lifestyle after injury, and a wide variety of disability related topics. Staff from the Hamilton Public Library are available to assist with finding appropriate resources. On the main level of the Regional Rehabilitation Centre there is an office for staff of Spinal Cord Injury Ontario. SCI Ontario offers peer support throughout the hospital stay and the transition to home or other community resource. Attainable, functional, rehabilitation goals have been determined. General health is stable, all necessary tests and acute care treatments have been completed. Physical endurance allows participation in a rehabilitation program, two-hours sitting tolerance and able to attend therapy for at least 30 minutes, twice a day. Demonstrated ability to learn and carry-over new learning and willingness to participate in rehabilitation. Within Hamilton Health Sciences a referral can be initiated by requesting a SCI Rehabilitation Consultation through the Order Entry function within Meditech. Referrals outside of Hamilton Health Sciences can be made by contacting the Intake Coordinator: 905-521-2100 ext. 40806.